The manager must prepare a number of periodic operating reports, including monthly tenant charges, balance sheets, budget reconcilliations, and the like. The manager is also responsible for supervising all employees needed to operate the centers, and for managing the operating account for the centers. 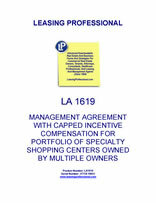 Type Shopping center management agreement for several specialty centers owned by different owners. Features Manager is required to manage and operate the shopping centers. This includes managing and supervising all employees, preparing financial reports, and conducting general business operations for the centers. THIS SHOPPING CENTER MANAGEMENT AGREEMENT (the "Agreement") is entered into and made effective as of __________________, 20__ (the "Effective Date") between the entities set forth on Exhibit A (each an "Owner"; collectively referred to herein as "Owners"), and RETAIL PROPERTY MANAGEMENT, a ______________ ("Property Manager") having its principal office in ____________, ____________ (such office herein referred to sometimes as the "Corporate Office"). Owners and Property Manager are sometimes referred to in this Agreement collectively as the "Parties" and individually as a "Party". A. Owners are the owners or lessees of those certain retail shopping centers listed on Exhibit B attached hereto together with the building and other improvements located thereon (each a "Center"; collectively referred to herein as the "Centers"). The allocated gross leasable area for each Center is set forth on Exhibit B, with an aggregate of ________________ square feet of gross leasable area for all of the Centers ("GLA"). B. Owners and Property Manager wish to enter into this Agreement pursuant to which Property Manager will manage the Centers upon the terms and conditions set forth below. 1. APPOINTMENT AND TERM. Owners hereby grant to Property Manager, as an independent contractor, and Property Manager accepts, the sole and exclusive right to manage, operate and lease the Centers subject to the terms and provisions of this Agreement. "Commencement Date") and shall continue in full force and effect until _________, 20__ (the "Primary Term") unless otherwise terminated as provided herein. Unless either Party notifies the other Party in writing that it does not wish to extend the term of this Agreement at least one hundred twenty (120) days prior to the end of the then pending term, the term of this Agreement shall be extended for successive one calendar year terms (an "Extended Term") upon the same terms and conditions set forth herein for the Primary Term including the payment of Compensation calculated in the same manner as the Compensation for the Primary Term. (i) An annual management "Incentive Fee" in an amount equal to _____% of the amount by which Net Operating Income (as defined herein) for the Centers in any calendar year exceeds the Net Operating Income for the twelve calendar months ending on ________, 20__ (the "Base Period"); provided however, the Net Operating Income for the Base Period shall be adjusted by increasing or decreasing the management fee payable during the Base Period to an amount equal to $_______ per square foot of GLA); and provided, further, the annual Incentive Fee shall in no event exceed $__________ (the "NOI Cap") or such reduced amount in the event one or more Centers are not subject to this Agreement as more particularly described in Section 2.1(c). If the Commencement Date occurs on a date other than January 1 or this Agreement terminates on a date other than December 31, the Incentive Fee for either the first year or the last year of this Agreement or both, to the extent applicable, shall be prorated and equal to _____% of the amount by which Net Operating Income for that portion of the calendar year exceeds Net Operating Income for the same portion of the calendar year in the Base Period but not to exceed a prorated portion of the NOI Cap. A calculation of the Net Operating Income for the Base Period, with the management fee adjustment described above is attached hereto as Exhibit C.
(ii) For purposes of this Agreement "Net Operating Income" shall mean for any period, the Operating Revenues (as defined below) for such period less Operating Expenses (as defined below) for such period. "Operating Revenues" shall mean all operating revenues of the Centers calculated on the accrual basis in accordance with generally accepted accounting principles ("GAAP") other than straight lining of rents including, payments from a tenant for the early termination of a tenant lease, business interruption insurance proceeds, vending income but excluding (i) extraordinary items of income as defined under GAAP applied on a consistent basis, (ii) sales, excise or any similar taxes collected, (iii) proceeds of sales involving dispositions of capital assets, furniture and equipment or operating equipment, (iv) proceeds from any financing, (v) any capital contributions or loans made by Owner or the equity holders in Owner, (vi) security deposits delivered by tenants (unless applied to rental income upon termination of a lease), (vii) rents paid for more than one month in advance, and (viii) proceeds from condemnation or sale in lieu of or under threat of condemnation, proceeds of insurance (other than business interruption insurance proceeds). "Operating Expenses" shall mean all costs and expenses of the Centers calculated on an accrual basis in accordance with GAAP, including, without limitation, the Management and Leasing Fee payable hereunder, real estate taxes, insurance premiums and employee costs but excluding (i) depreciation and amortization, (ii) income taxes, (iii) interest expense and (iv) other items which would be capitalized under GAAP, such as, tenant allowances and property improvements. (iii) the Net Operating Income for any such Center shall be excluded from the calculation of the Base Period Net Operating Income and all subsequent years for purposes of determining the Incentive Fee.